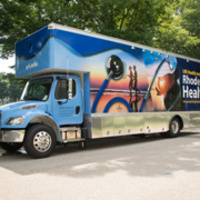 Join the University of Rhode Island, along with the state’s Executive Office of Health and Human Services, Department of Health, and other partners, to introduce a new Rhode to Health mobile unit, which will be operated by staff and students from URI's Academic Health Collaborative. This program, which is part of the state’s HIV COEXIST project, will provide HIV early identification and care, education, general health testing, and integrated behavioral health treatment services with an extensive outreach component for those vulnerable populations that do not have easy access to care. This integrated mobile unit will travel throughout Rhode Island to meet the needs of people living with HIV and/or those unaware of their HIV status. Parking is available behind the URI Higgins Welcome Center, 75 Briar Lane entrance. Follow "Rhode to Health" street signage to guest parking in Lot 1 behind the Higgins Center. Please use 75 Briar Lane, Kingston, RI 02881 in your GPS. Enter campus via the main entrance onto Upper College Road (off Route 138). Follow to the four-way intersection and turn Right onto Briar Lane. Proceed down the road and the entrance to Lot 1 is on the left.